After so much speculation we can today reveal Intel's X99 chipset, more specifically, the X99S Gaming 9 AC motherboard from MSI. MSI are widely regarded as one of the most overclocking friendly manufacturers and so our review will focus heavily on this area. While the Gaming 9 is not the flagship motherboard or even the flagship 'series' (this tag goes to the XPower range - soon to be reviewed by us), a motherboard's prowess is quite often judged not just by the abundance of features but by its ability to take your components to the edge without falling over in a smouldering mound of silicon and plastic. There is a wealth of information to get through today as at Vortez we feel the end user deserves a thorough appraisal of the component reviewed rather than a basic - 'how fast can it go' overview. To this end, we hope you find this review both informative and enjoyable should you be dreaming of your next upgrade or indeed in the market for such components. If you haven't already done so then please check out our Intel Haswell-E review of which this motherboard was the foundation and proved to be a very worthy test best for Intel's finest. However, before we give too much away, let's take a look at the new X99 Chipset features which will give you an indication of the performance you can expect from Intel's flagship 'Enthusiast' product. Micro-Star International Co., Ltd (MSI) was established in August 1986 by 5 founders, one of the world's largest information technology manufacturers. 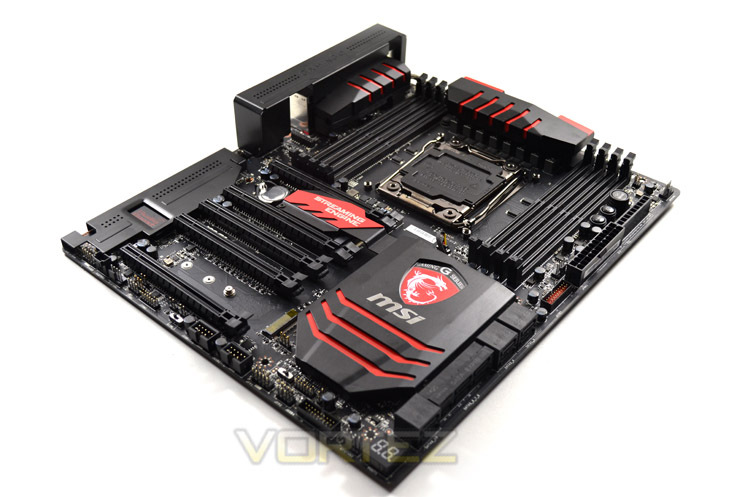 MSI started from the motherboard and graphics card industries and extended into consumer and commercial electronics including notebooks, All-in-One PCs, servers, workstations, industrial PCs, household appliances, car infotainment products, barebone systems, multimedia, communication devices, and others. MSI holds itself responsible not only to its clients, employees and stockholders, but also to the society and environment as a whole to consistently fulfill its corporate commitment. With innovation and style as its core value, customer satisfaction and premium service as its goal, MSI will definitely be the most brilliant star in the global brands!